Absolutely our favorite seafood here in Florida, these little gems taste just like lobster! Florida Rock Shrimp. Rock Shrimp are sweet and the best thing that's the closest taste to lobster. Florida Rock Shrimp, very different from regular shrimp. Their bodies are rock hard, when cooked and dipped in butter they taste like little lobster tails! Place the rock shrimp on a cutting board, dorsal side down and the swimmerets up. With a sharp knife, cut from the base of the tail to the other end, but not through the shell. Gently spread the meat apart to expose the sand vein and wash under cold running water. In a large pot of lightly seasalted water, bring to a boil, place rock shrimp in boiling water. Rock shrimp cook more quickly than other shrimp. Stir, and after 35 seconds pour into a colander and rinse with cold water. Place on a large boiler pan or cookie sheet lined with parchment paper. Brush lightly with garlic butter below, broil on high for 2 minutes, serve dipped with melted butter... enjoy! Clean and wash rock shrimp, remove all shell. Flour Seasoning: 1/4 cup flour, 1 tablespoon cornstarch, 1/2 teaspoon garlic powder, 1/4 teaspoon each salt, pepper, cayenne. In a large plastic bag mix together, shake rock shrimp in the seasoned flour. Fry in hot oil till browned, do not overcook. Serve with Hot Sauce. Rock shrimp (Sicyonia brevirostris) have a hard, spiny shell more like a lobster rather than its shrimp cousins. The shell is "hard as a rock," hence the term rock shrimp. They live and spawn in warm deep waters, 120 to 240 feet. Until machines were invented to process them, rock shrimp were popular only with avid fishermen and divers because getting to the meat through the hard shell was such a chore. Today rock shrimp is readily available, both fresh and frozen, head on or off, split and/or deveined. Rock shrimp do not grow as large as their shrimp cousins. Like shrimp, they are sorted and sold by count, meaning the number of shrimp it takes to weigh in at 1 pound. The largest commercially-available rock shrimp are 21 to 25 to the pound and are about 2 inches in length (although some have been found measuring up to 6 inches). Nice info on rock shrimp Claudia. They really are delish and very much gems! I'll take them all these ways!! These look delicious and so fresh! The photographs are really beautiful Claudia! I think they should call them Rock Lobsters. They look delicious, I expect a big plate of them waiting for me when when I make it to FL. I've never eaten these but I'm sure I could go for a plate 3-ways - they look and sound delicious. Clauia, I want to go to Florida if only to visit you and eat at your table! YUM! I have no idea if I've ever eaten rock shrimp. I know this ... I want some. Lots of cool information on a critter I was not too familiar with :) Thanks for sharing! Shrimp I could eat everyday! Great info on handling and preparing, thanks. Oh, Claudia, these are GORGEOUS. If I can find them, i'm going to make them - especially with that garlic butter! Oh, how delicious! My parents and my sister and her family live in Florida. I am going to forward a link to this recipe. They will love it! When I visit Florida in June, I am going to request that they make your recipe for me! I just love Rock Shrimp! Thanks for all of the info, Claudia. Your photos are great. They looks awesome. Nice for the info about them. Your pictures are watering me...as always! Wow Claudia, I could eat every single one of those in one sitting! They look amazing. I can't find rock shrimp, but order it any time I see them on menus. I love all three versions here! Yum, I have never had or heard of Florida Rock Shrimp but it sounds fantastic. When I was in Florida my boyfriend (at the time) used to be big on boiling crab. Mmmm, all of a sudden I miss seafood. I just don't eat it as much here in the Midwest! I would love to try this! I will definitely look to try it when we visit Florida. I should tell Grumpy when I talk to him tonight to look for rock shrimp on the menu! I have never seen it up here ever. Your shrimp look so succulent and delicious! Lovely photostoo. I never had these before! Being a shrimp lover I know I would love them! Both versions look wonderful. I've never had these, but if they taste like lobster tails then I can only imagine how delicious they are! You're making me miss living on the coast! Oh my! I wish we could get fresh Florida rock shrimp here. This looks fantastic. Claudia, this shrimp looks so good!! I don't know if I've ever had that type of shrimp, but I wouldn't mind diving into those right about now. Mouth.Watering. I used to get rock shrimp all the time when I lived in Miami. This post is making me miss it! Thank goodness for some machine inventions...especially for the offering of this shrimp variety. aww... I could eat them anytime.. perfect appetizer. so tempting ! Awesome recipe! It looks like it really rocks. Just for the record, which one tastes best? The boiled, broiled, or fried? Thanks! I've read about these shrimp, but not been so lucky as to have tried them. They look amazing! I love shrimp ... this looks amazing!!! I would love to sit in front of a big plate of these babies! 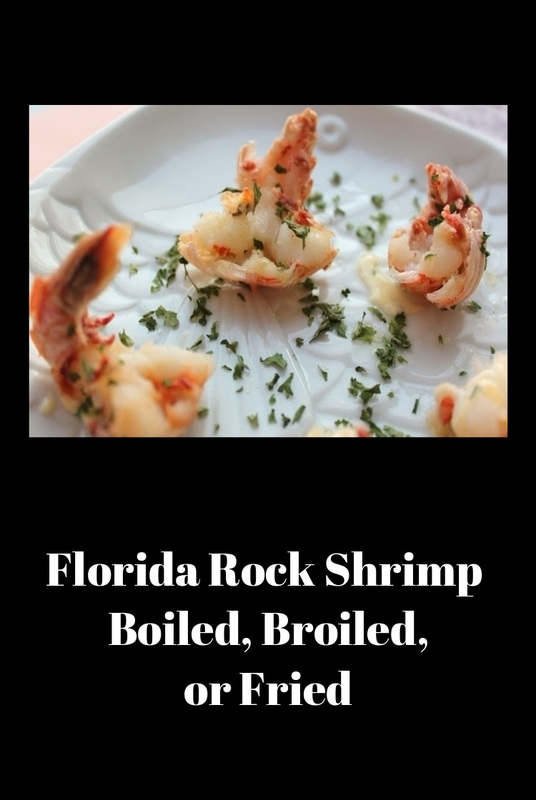 I remember having rock shrimp when I have visited Florida in the past - they are truly scrumptious. Thank you for sharing this delicious post with Let's Do Brunch. The linky is up again for this week so I do hope you will come along and join in again! Thanks for participating in April's YBR :) Your shrimp look simple amazing and mouthwatering.